Honda has introduced a special ‘Alive’ edition of the WR-V cross hatchback. It is based on the S variant of the WRV and costs Rs 23,000 over the standard trim. Additions include 16-inch alloy wheels from the VX model, rear parking sensors and a parking camera with an IRVM-integrated display. Notably, Honda has also increased prices of the WR-V. The base-spec petrol is dearer by Rs 1000, whereas the top-spec model costs Rs 10,000 extra. On the other hand, the WRV S diesel has seen a price hike of Rs 6,000. Prices for the top diesel model remains unchanged. Honda WRV prices start at Rs. 7.84 lakh for petrol and goes upto Rs. 9.35 lakh. The prices of WRV diesel variants start at Rs. 8.93 lakh and the top-end diesel is priced at Rs. 10.48 lakh. Honda WRV is available in 10 variants and 6 colours. Share your experiences with WRV? The claimed ARAI mileage for the Honda WRV petrol is 17 kmpl, and for the Honda WRV diesel is 25 kmpl. Q. Vehicle is nice or bad? Q. Which would be the best choice to buy between Honda City Petrol SV variant and WRV Diesel VX. The usage of car is for personal family use of 50% city rides and 50% highway trips. Kindly suggest your opinion. Q. Which is better Honda WRV or Mahindra TUV 300? Q. What's worse in the petrol WRV? I was thinking to buy one but now after seeing your review i feel to go for Nexon XZ Plus petrol. Q. What the different in WRV? Got a higher wheel base, the diesel variant is fuel efficient 21km/ltr+. good boot space. good pick up . The WR-V is said to be more than just a Jazz with some butch livery. Does it feel like it? The cross-hatches battle it out! To take on the likes of Hyundai i20 active and Etios Cross, Honda has launched WR-V in Indian market in the price range of Rs7.67- 9.92 lakh (ex-showroom, Delhi). The WR-V is based on the Jazz platform though it looks entirely different thanks to the beefed-up wheel arches, all-around cladding, and aggressive nose with thick slatted chrome grill. Interiors are made up of quality material and asymmetric theme of the Honda continues inside the WR-V also. There are many first-in-class features like sunroof and infotainment system with inbuilt Wi-Fi connectivity for luring millennials. Honda W-RV is powered by a 1.2-litre petrol and 1.5-liter diesel engine capable of putting out 89PS/110 Nm and 100 PS/ 200 Nm respectively, mated to the 6-speed manual transmission with no automatic option available for now. Honda is offering WR-V in two trim levels -S and VX in both petrol and diesel guise. At first glance, the Honda WR-V looks like the tougher cousin on the Jazz hatchback. Although it is based on the Jazz, the WR-V gets a completely redesigned nose and the bonnet now sits much higher and flatter. The front and rear bumpers look butch and get a faux skid plate as well. Although Honda has tried really hard to hide any resemblance to the Jazz, the side profile of the car will remind you of the hatchback. However, the WR-V stands tall with a ground clearance of 188mm, which is only 10mm less than the Maruti Suzuki Vitara Brezza. Despite looking tough from the outside, the WR-V’s cabin feels very similar to the Jazz’s interior. The first thing you’ll notice is the segment-fist sunroof, which when paired with the larger greenhouse amps up the sense of space. It can accommodate tall passengers quite easily as there is enough headroom and legroom. The seats, on the other hand, are quite soft and foamy, which is well and good for short distances but will give you some discomfort on long road trips. The top-spec WR-V comes with all the bells and whistles you’d expect. You get a smart key, push button start-stop, and cruise control. A 7.0-inch touchscreen infotainment system with built-in navigation and voice controls can also mirror your smartphone and double up as the display for the rear parking camera. The WR-V is offered with two engine options - a 1.5-litre diesel engine with a 6-speed manual gearbox or a 1.2-litre petrol motor paired with a 5-speed manual. Like all other Hondas, the cross-hatch is an effortless drive. The diesel, although noisy, is the one that balances city and highway jaunts better. The WR-V is offered in just two variants with each engine option. The VX trim offers additional goodies like one-touch open and close sunroof, fog lamps, 16-inch diamond cut alloys, multi view rear camera, six speakers, etc. The diesel variant gets two exclusive features - cruise control and passive keyless entry. The extra features offered in top-spec variants justify the Rs 1.25 lakh premium they command. Maruti Suzuki Vitara Brezza: The Maruti Suzuki Vitara Brezza seems to be the biggest threat to the Honda WR-V. The Brezza offers a more engaging drive, can seat your entire family and gives you a much better SUV experience overall. Tata Nexon: Among the best vehicles to roll out of a Tata factory, the Nexon comes very close to acing the compact-SUV game. The funky styling, big 350-litre boot and some segment-firsts like an activity key make it a formidable force in the segment. Hyundai i20 Active: Hyundai’s i20 Active is your friendly neighbourhood Elite i20 on stilts. It retains the plush interiors, the easy to drive nature and the host of tech. It’s nowhere close to being a SUV or a crossover, but is a fantastic cross-hatch nonetheless. The WR-V borrows quite a lot from the Jazz but manages to stand tall on its own toes. It’s got space, it’s efficient and has the right amount of feel-good features. Then there’s Honda’s reputation for reliability. Also, it’s your only option if you want a cross-hatch with a sunroof. So, there. 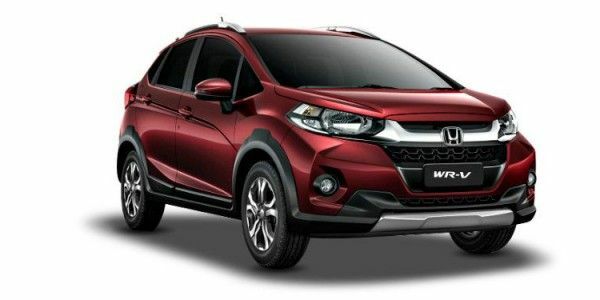 Honda WR-V: Worthy Alternative To Honda City? The WR-V makes for a great alternative if you were eyeing the City. Allow us to explain.